Hello! I am a big fan of Killerfish Games. I own all of Atlantic Fleet and Pacific Fleet and I was well-satisfied with it. Just few questions I am curious about the new Cold Waters game. 1. Will it be Turn-Based game? 2. Are you planning for a Mobile(IOS) release of Cold Waters? 3. When do you expect to release the game? 1. No. All ships, aircraft and weapons move in real time. 2. Yes it is planned. After the PC version is completed we will investigate what is required to port the game to mobile. However Cold Waters is a full PC game and a mobile version will likely have to be simplified in various ways or may not even be suitable for mobile devices. 3. When it is finished and we’re happy with it. No actual release date determined at this time. Will the mobile version of Cold Waters be modable? Hello Mr. Sincock and Mr. Ducker, I am very excited for the release for the game. I read the Q&A and I just have one question: how much will it cost? You stated that it wouldn’t cost the same as Atlantic Fleet, which I completely understand. (After all, you guys are working hard on this next game) so would it be about $20? $30? I wouldn’t mind the price but I’m just wondering. Price has not been determined at this stage. Will it based on Android? It is no doubt that there’ll be an excellent game……can I play on an Android phone? If you do make a iOS version of the game will you still keep the PC version and the mobile version the same but with some small changes. And will you make a game like picfic fleet but with the controls of Atlantic fleet and realism and. Damage system? If the conflict escalates to thermonuclear war, will we get to target where to send the nukes or will we just have a message saying the game is over and the world is destroyed? Closer to the latter as a campaign ending event. Hello, I’m just wondering if the mobile version will also be in real-time? Will there be American aircraft carriers? Not directly in 3D. The player submarine operates in isolation from friendly units. However they are in the campaign as a mission parameter. Will we be able to control multiple units, one by one, like dangerous waters? I’ve never played RSR, but from what I know it was like SH where there was only one controllable submarine, and you were always on it unless docked. Hey Killerfish just wondering about the progress of the game. We haven’t heard from you guys for a long time! I don’t mind about the release date, whenever it’s ready I’m gladly going to buy it. But some new pics would be nice! Hello I am super excited about this game ! I own already both Pacific fleet and Atlantic fleet and still enjoy so much ! You have done a really good job and I will buy this game on his release date. However I am wondering if there will be a custom battle like previous game ? If yes how many units will there be per side ? (Ex : 3vs3 in PF and 10vs10 in AT). Cold Waters is different to Atlantic Fleet and Pacific Fleet. You are the commander of a single submarine, similar to the Silent Hunter series. Will ships split in two? Looks great, just one question.. Will there be internal stations and or Control Room..? Is it an opposite side ( eg the soviets) campaign planned? Raiding NATO convoys with subs – or even Tu-22M Backfires!! !- would be an awesome possibility. Yes a Soviet campaign is being planned post-release. Cold Waters is a submarine simulation, aircraft cannot be controlled. 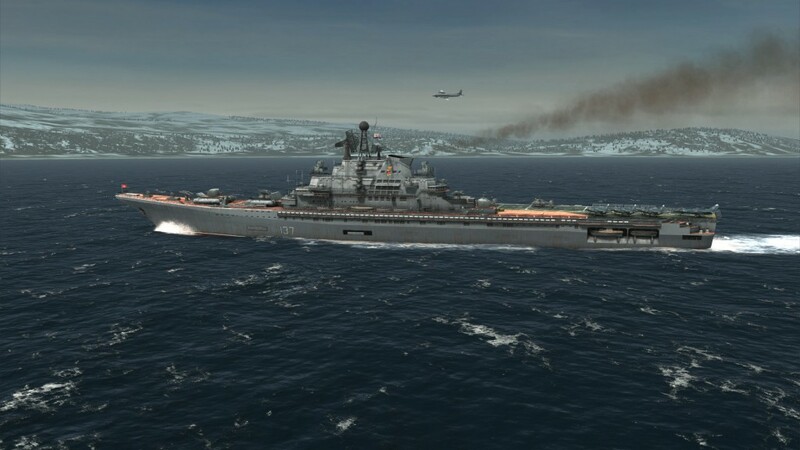 Please add Kirov-class battlecruisers and Typhoon(Akula)-class nuclear submarines. Both are confirmed as in. Really looking forward to the game. What are the specs needed to run the game? I am hoping to run it on a year old laptop Nvidia GTX960M, I7, 16gb ram. The graphics on the previews look great, but I am concerned if the Nvidia 960 will run it. Should easily run on those specs. Will it work on a chromebook? Also, the new trailer looks great. Are you guys still planning on a mobile release post-release? Awesome game guys, thank you! I see you are planning to release a Soviet campaign, will diesel boats be playable with the associated battery recharge constraints? Also, any plans to add a NATO campaign with UK, DE, NO, NL boats?